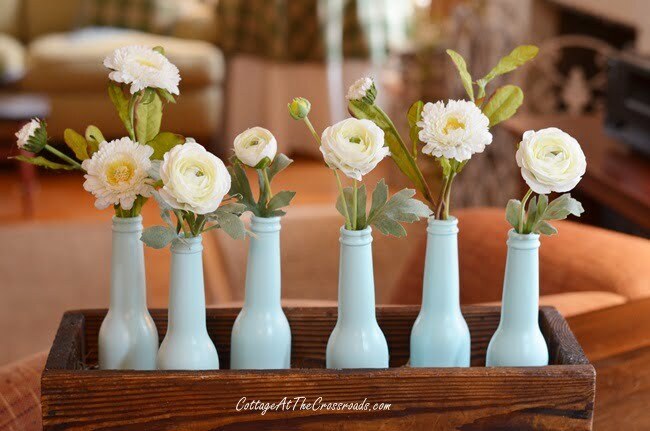 In this post you’ll find a very thrifty painted bottle spring centerpiece! Who doesn’t like thrifty? Hello sweet friends! Today is Valentine’s Day and I just want to take a moment to tell you how much I love and appreciate our readers! Without you, there would be no reason to blog. 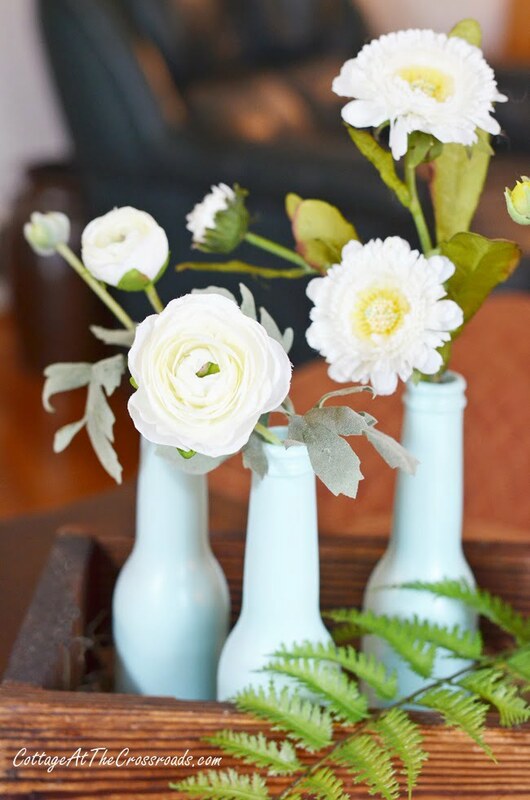 Today the Thrifty Style Team and I are bringing you lots of ideas to celebrate early spring. 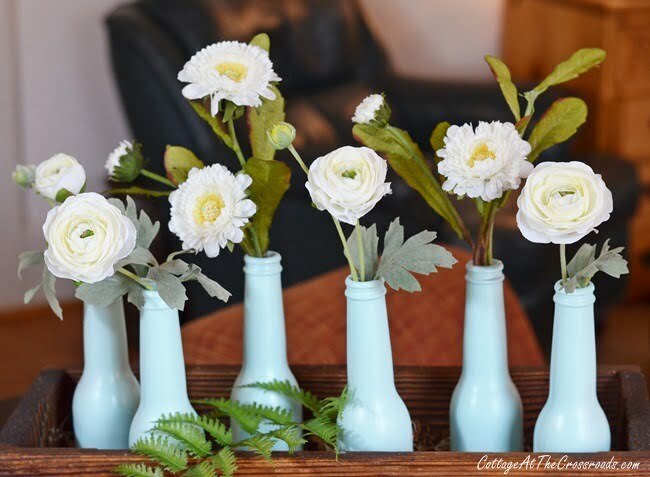 I’m sharing a painted bottle spring centerpiece that was so easy to create! Right now I have it on the sofa table, but I’m sure I’ll be using it in several places this spring. I just love the pretty aqua blue bottles. Did you recognize the bottles? They are small beer bottles. Now first, I need to tell you that I am not much of a beer drinker but when I get really thristy, there is nothing like a beer to quench my thirst. Usually I drink only 1 beer and sometimes don’t even finish it. So one time Leo went to the grocery store for me and came back with these Coronitas. He explained that the word “Coronita” means small Corona. Seven ounces is the perfect size for me, and when I finished up a six pack, I thought I’d do something with the little bottles other than recycle them. When I was in Hobby Lobby recently, I picked up this pretty soft shade of aqua in a matte finish. I have a few tips for you if you decide to paint some bottles. 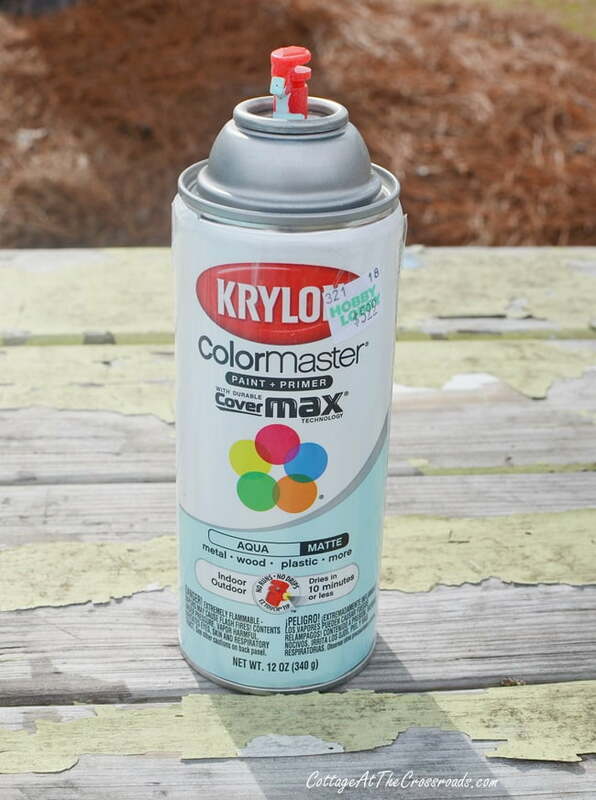 Choose your spray paint color in a matte or flat finish. Prep your area with newspapers, cardboard, or plastic in a well-ventilated area. 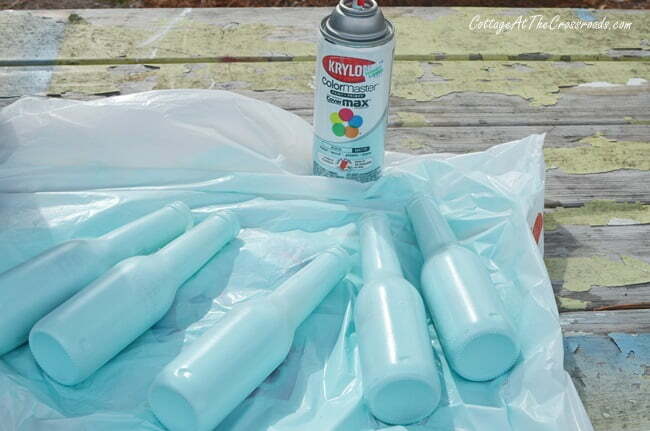 Spray a very light coat on one side of the bottles. Don’t spray too closely. Allow to dry thoroughly. Repeat the process on the other side and let dry. Apply several more light layers, if needed. I placed my bottles down inside a pine box that I already had. I happened to already have some white faux flowers so I tucked those down inside. 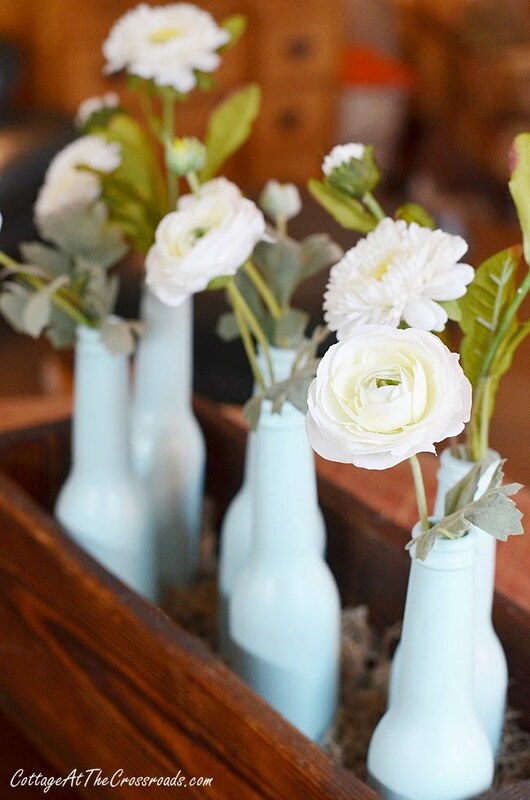 Can you imagine how pretty these would look with real ranunculus or perhaps white tulips? But since it is not even spring yet, the faux flowers are bringing a breath of fresh air into our living area. 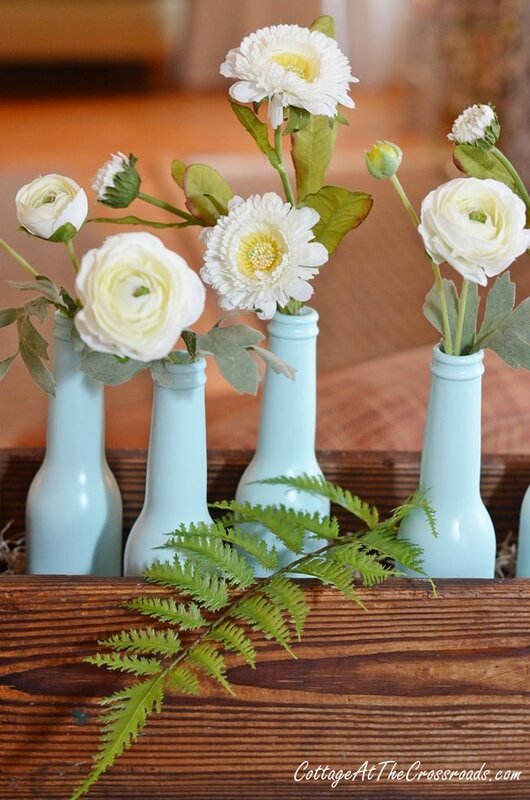 I’m loving the white flowers in the pretty aqua bottles, but I’m imagining all sorts of color combinations. Who knew that beer bottles could be so pretty! I can’t stop looking at them! They are so darn cute! You guys know how much I like to make something from nothing, right? Right now as I’m writing this post, I’m dying of thirst. If it weren’t so late, I’d send Leo after some more Coronitas! Then I would get double enjoyment out of them! Have you met all of the super talented ladies on our Thrifty Style Team yet? Check out all of their awesome ideas by clicking on the links below. These are so pretty – and I thought for sure that your flowers were fresh!! They look so real! 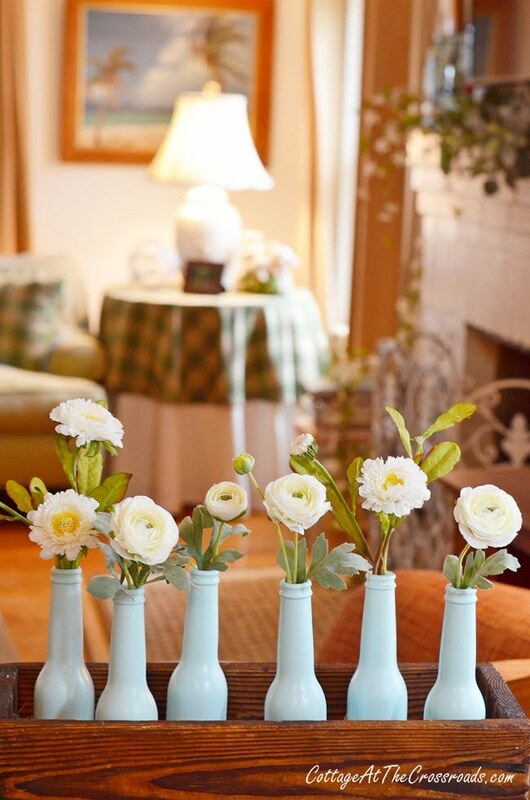 Jane, What a delight to see your lovely and thrifty Spring centerpiece. The bottles are just the right size, aren’t they? I love visiting your blog and seeing all of your creativity. 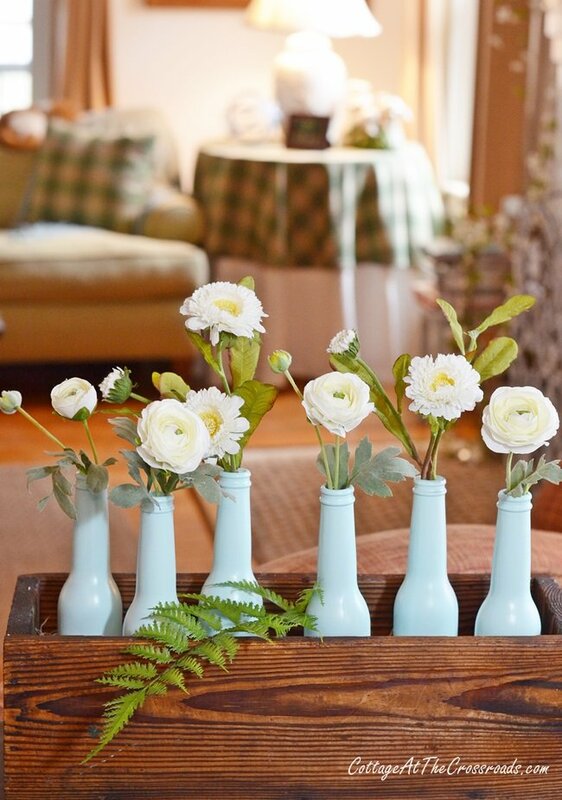 Those Coronita bottles are PERFECT for this…turned out adorable with paint. Love the color you chose, too…so perfect for spring. 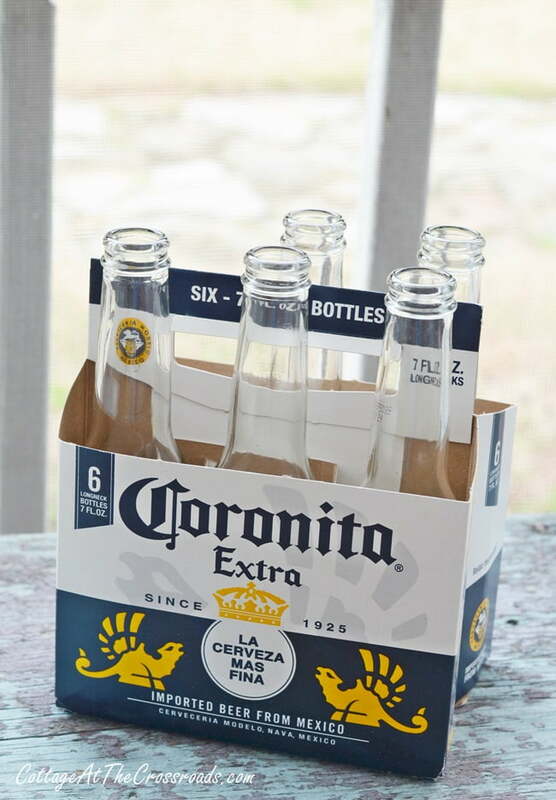 Coronitas?? How did I not know they had those?? 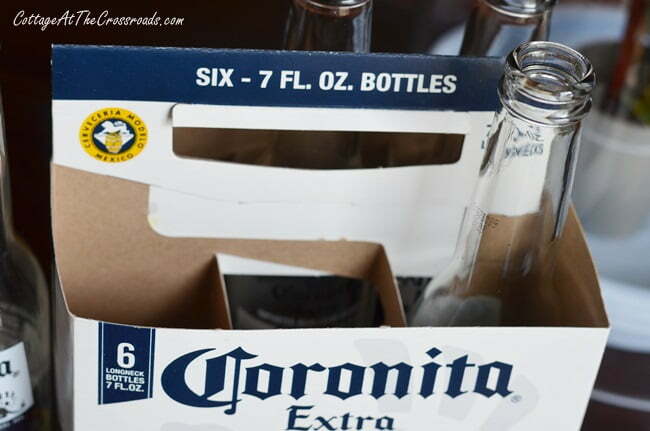 There’s nothing quite like a Corona with lime! 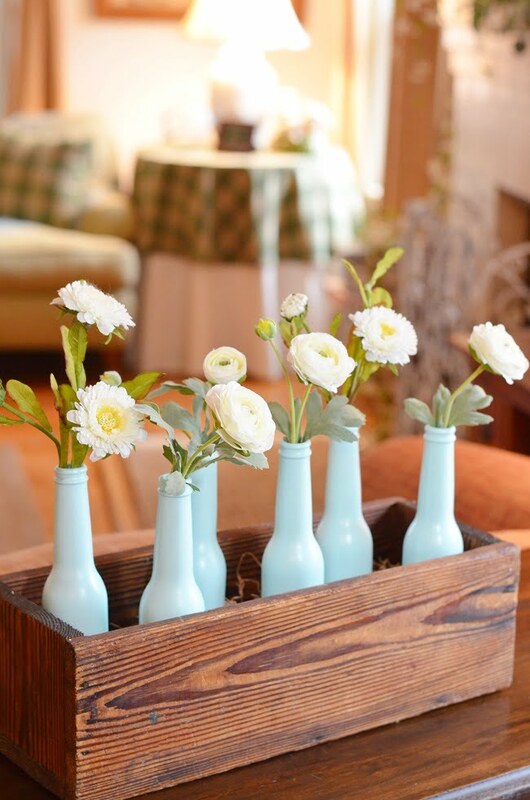 The bottles look so beautiful painted and perfect in that rustic crate. Well done Jane! These are so darned cute! It’s magical what a little paint can do! What!?!? Beer in little bottles?? My beer buyer has been holding out on me! Jane, I love how perfectly sweet and thrifty this is…that color is perfection! Yep, I LOVE IT! It’s such a great way to upgrade those bottles. Your display is gorgeous. I love that shade of aqua. It turned those beer bottles into a masterpiece.